If there is one thing that is more fascinating to me than the architecture of Chicago, it is the story that lies behind each building. Every structure, no matter how grand or mean, was designed, built and inhabited by real people, each of whom has a life story that fades over time. We can’t know the whole story, of course, but occasionally we get small glimpses that humanize the ghosts of the past and make them come alive again. Take one small example – the Ernest Ammon house at 629 West Fullerton Avenue, an attractive Queen Anne residence of limestone and red granite, finished in 1889. The AIA Guide to Chicago considers it important enough to list although there is no description of the property, just the architect, address, Mr. Ammon’s name and the date the home was completed, 1889. We don’t hear much at all these days about Fromann and Jebsen, but it must have been a firm that was busy and well-off. 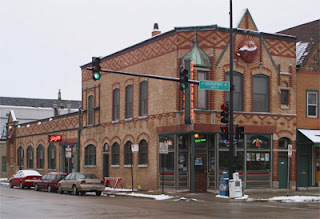 From 1877 to 1906 the firm designed 27 buildings for Edward Uihlein and the Schlitz Brewing Company, many of these buildings “tied houses,” taverns that carried the Schlitz name and sold the company’s beer. Schuba’s at the corner of Belmont and Southport, finished in 1903, is one such Fromann and Jebsen tied house. The firm took on a variety of other commissions throughout the city. And the designs were wildly diverse, ranging from Tudor to Gothic Revival and Empire styles to the Arts and Crafts and Prairie styles of the early 20th century. 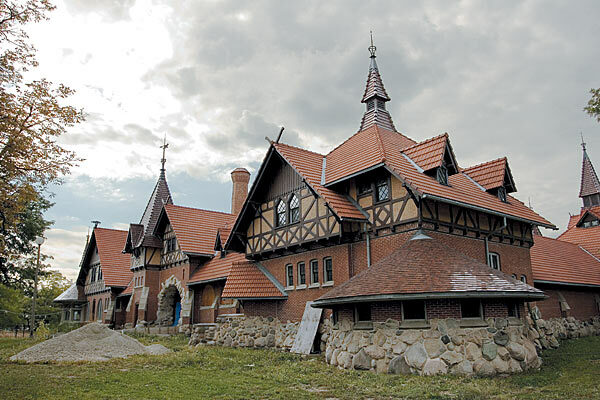 Without a doubt the most lasting and conspicuous commission of Fromann and Jebsen was the 1895 Humboldt Park Receptory and Stables. 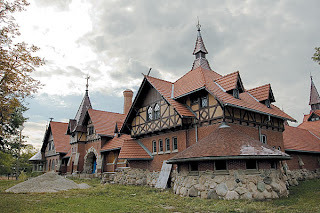 The structure, which originally housed stables, a reception area and a comfort station, is a feast for aesthetic eyeballs, a riotous combination of turrets and gables complete with a wagon wheel and horse’s head at the peak of the half-timbered reception wing’s roofline. Fromann and Jebsen . . . one aspect of the story of 629 West Fullerton. But you keep looking . . . the AIA Guide to Chicago lists the original owner – this Ernest Ammon guy, obviously a gentleman well off enough to hire an architect of some repute to design a home for him out in Lakeview Township. (Chicago annexed the township in 1889, the same year that the home was completed . . . so the lot must have been purchased before the annexation when Lakeview was a sleepy town out in the country). Unlike many Chicago residents of the late nineteenth century, Ernest hasn’t left a whole lot of information for us over a century later. And then, unexpectedly, way back in the Google pages, a reference – a case that came before the Supreme Court of the United States in April of 1892. It seems that our Mr. Ammon had sued one Aut Miller, “a citizen and resident of Wisconsin,” seeking $5,287 for “1,125 gallons of sherry wine and 1,100 gallons of port wine” that Mr. Miller had entered into a contract to purchase and for which Miller had not rendered payment. The lower courts found in favor of Ammon and awarded him the money. But Mr. Miller balked and the Supreme Court ended up with the sherry and port dumped in its docket. So Mr. Ammon had skipped the 250 bucks for the license and . . . wouldn’t you know it, a contract that is entered into in violation of the law cannot be enforced. So Ammon was out the $5,287, not to mention close to 2,500 gallons of wine. It is stories like these that make the walk through architectural history so fascinating.